The Austrian U19 national team defeated France in the final of the EFAF European Junior Championships with 21:12 and thus defended their European title. Both teams fought a duel, which was mainly due to a strong defense performance in the second and third quarter of Game opt for the Austrians. Austria won the first Cointoss and chose the 2nd Half option. After a short, pointless scanning both offense departments began linebacker Carl Tembo on a pass from quarterback Austria's Christoph Gubisch and Returned the ball into the end zone. The extra point attempt by Florian Angelini was blocked and it was 6-0 for France. The favorite for the title of the Alpine republic refused to be impressed by them. Quarterback Christoph Gubisch made his wrongs and escaped with a nice-play option all the French defenders. 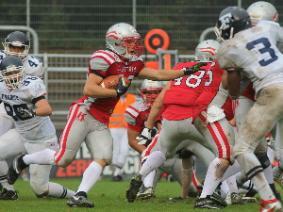 Kicker Daniel Bernklau made it better than his French counterpart and so Austria was nearly 7:6 lead. In the following two quarters of play dominated the defensive departments of both teams and it was much gepunted. Successfully be played fourth attempts were few. In addition, both Austria and France made life unnecessarily difficult with penalties. Shortly before the end of the first half, then flashed back to the strong offensive of the Austrians. Wide receiver January Grischenig caught a pass from quarterback Gubisch and carried the egg under the loud applause of the many Austrian fans in Cologne Sportpark Berg height about 41 yards into the end zone of the French. Daniel Bernklau converted the PAT again and it was little more than a minute before half-time 14:6. In the second half, Austria's arrow faster running back Matthias Kiegerl presented at its best. Not for nothing, he secured the MVP title of the game and has also been elected to the most valuable player of the tournament. However, more than an unsuccessful field goal attempt of the Austrians from the 21 yards line did not jump out at first then. Only in the final quarter of play, there was again something to celebrate. A nice run on Jeson Lengudiana, the right to be reaped the MVP title of the game for France, the French brought the gap to 12:14. Shortly before the end of the game running back Matthias Kiegerl was then prevented by a handle ugly face grille on continued running. After a pause, he retaliated turn for the nasty foul on the only right way: with a touchdown. Also the extra point by Bernklau was good and it was 21:12 for Austria with only 2:40 on the clock. France, however, did not give up then, but secured a first down after another and played a fourth attempt at 31 seconds remaining playing time of the owner. The predominantly Austrian spectators in the stadium now made lot of noise and burst into loud cheers as the snap of the French Center for another fourth down sailed over quarterback Idriss Ramky time. Austria knelt after the turnover on downs and was off deserves celebration as old and new European Champion.